My plans of attending Wavelength over the past week seem to have been defeated; of five shows, over the past week, I only attended one. For those who didn’t read my previous post, Wavelength is a music series that has happened every Sunday for the past ten year. To celebrate Wavelength 500 and mourn the end of the weekly series, Toronto was lucky enough to see a five night festival happening in various venues throughout the city. I missed the first four shows, and unfortunately wasn’t able to see The Bicycles, Laura Barrett, Evening Hymns, Diamond Rings, Picastro, Constantines or numerous other bands, I did however get to see a show I will never forget. Opening the show were Boars, Neck & Mean Red Spiders. They were all good. I enjoyed them all but don’t remember enough about any of them to have anything much to say. The Barcelona Pavilion were probably my highlight of the show. I had wondered for a long time why anyone cared for any music performed by Steve Kado. I had seem him perform a number of times, and just didn’t get it, it didn’t make sense to me. Sure, I had respect for him, and the □□□□□□ Recording Club he helped found and admired the spirit of DIY so very much embodied by □□□□□□ and Wavelength. I’ve also been to The Boat many times and seen bands who were part of the Bad Band Revolution, and always wondered why anyone liked this self-admitted “bad bands,” seriously, they were horrible. I’ve always related Kado to that. Kado used to play in a band called The Barcelona Pavilion, and they reformed in their original lineup for Wavelength 500. I was blown away by their performance, sure musically, it fit in with the bad band revolution, but it had all those wonderful tenants of good punk! I also haven’t moshed in a long time, and that was a nice change from usual… oh and did I mention that Maggie MacDonald is hot? The best I can say about Kids on TV is that they are theatrical; I could also say they’re gay, but for some odd reason the two seem to go hand in hand. Their set didn’t really do anything for me, and I didn’t quite understand why anyone else was enjoying it; I found it to be cliché and boring. Did you know that “Tranzac” is an adjective? As in, “This band is rather Trazacy.” Well, before Thomas came on, I asked someone what they were like, and he said “Tranzacy.” Then after getting bored with them, and hovering elsewhere in the bar, I mentioned my boredom to someone else, and she said, “yeah, they’re very Tranzac.” In closing, they were boring, and not an exciting secret act, the following secret act was much better. Did someone say Owen Pallett? Oh my! For those who don’t know Owen Pallett used to record and tour under the name Final Fantasy. He’s recently decided to start going by his actual name. Pallett’s set’s biggest drawback was the 30 minutes for him to set up his excessive amounts of gear to play four songs. However, those four songs were absolutely wonderful. 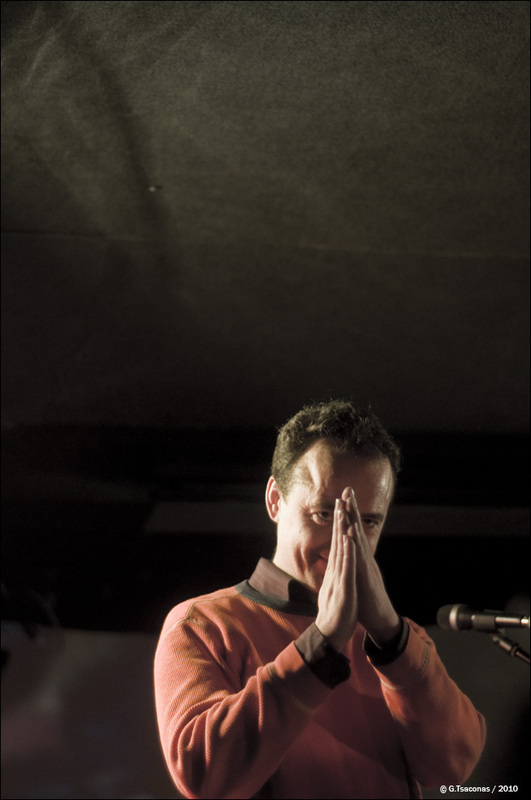 Before he left the stage he announced that he would be back in a few with The Hidden Cameras. Yes, The Hidden Cameras. I’ve never been a fan. I have a strange double 7″ EP, and have listened to it a couple times. but I never really got into them. Unlike Kids on TV, I completely understand why they have a following, and really dug seeing them live. I was able to get into the groove of the audience, and enjoy the show for what it was. I still won’t be buying any of their records any time soon, but I’ll have fun if they randomly decide to close a show I’m at. Above photo of Doc Pickles taken by Garry Tsaconas, used with permission.